Indian rights activist Kailash Satyarthi and Pakistan's 'Heroic' teen activist Malala Yusafzai have together been awarded the prestigious Nobel Peace Prize for 2014. Kailash Satyarthi, an Indian children's rights activist, was on Friday awarded the Nobel Peace Prize for 2014. Satyarthi won the prize along with Pakistan's Malala Yousafzay. 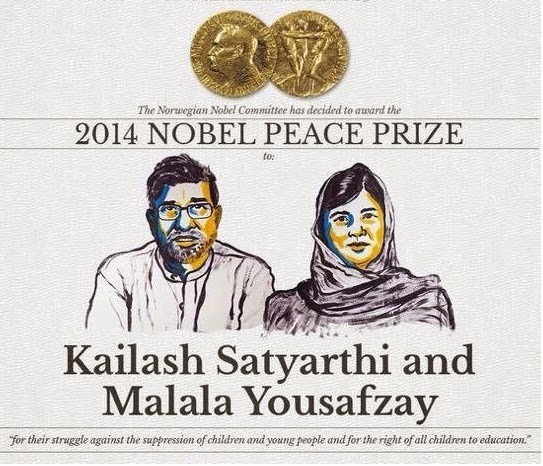 "The Norwegian Nobel Committee has decided that the Nobel Peace Prize for 2014 is to be awarded to Kailash Satyarthiand Malala Yousafzay for their struggle against the suppression of children and young people and for the right of all children to education," said the official press release. In one of his first reactions, Satyarthi told Times Now, "This is an honour for me and my fellow Indians and all those children whose voices were never heard before." "Showing great personal courage, Kailash Satyarthi, maintaining Gandhi's tradition, has headed various forms of protests and demonstrations, all peaceful, focusing on the grave exploitation of children for financial gain," the release said. "He has also contributed to the development of important international conventions on children's rights," the release added. On Malala Yousafzay, Committee said, "Despite her youth, Malala Yousafzay has already fought for several years for the right of girls to education, and has shown by example that children and young people, too, can contribute to improving their own situations. This she has done under the most dangerous circumstances. Through her heroic struggle she has become a leading spokesperson for girls' rights to education." "The Nobel Committee regards it as an important point for a Hindu and a Muslim, an Indian and a Pakistani, to join in a common struggle for education and against extremism. Many other individuals and institutions in the international community have also contributed," the release said. Prize motivation: "for their struggle against the suppression of children and young people and for the right of all children to education"